Michael Mann’s 'hockey stick' graph is statistical nonsense, and scientists haven’t been able to replicate it. The hockey stick graph has been confirmed again and again. There's also plenty of other evidence to show us the Earth is warming. The "hockey stick" describes a reconstruction of past temperature over the past 1000 to 2000 years using tree rings, ice cores, coral and other records that act as proxies for temperature. The reconstruction by climate scientist Michael Mann and his colleagues found that global temperature gradually cooled over the last 1000 years with a sharp upturn in the 20th century. The principal result from the hockey stick is that global temperatures over the last few decades are the warmest in the last 1000 years. A critique of the hockey stick was published in 2004, claiming the hockey stick shape was the inevitable result of the statistical method used (principal components analysis). They also claimed temperatures over the 15th century were derived from one bristlecone pine proxy record. They concluded that the hockey stick shape was not statistically significant. 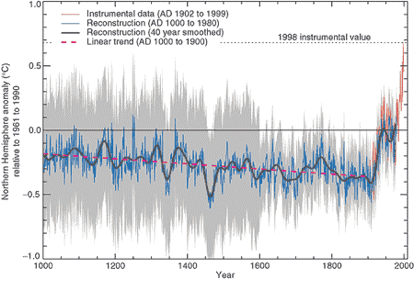 An independent assessment of Mann's hockey stick was conducted by the National Center for Atmospheric Research. They reconstructed temperatures employing a variety of statistical techniques (with and without principal components analysis). Their results found slightly different temperatures in the early 15th century. However, they confirmed the principal results of the original hockey stick — that the warming trend and temperatures over the last few decades are unprecedented over at least the last 600 years. 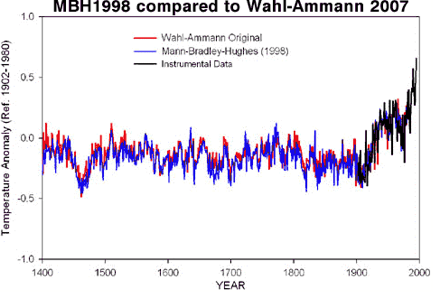 Figure 2: Original hockey stick graph (blue - MBH1998) compared to Wahl & Ammann reconstruction (red). Instrumental record in black. © UCAR. While many continue to fixate on Mann's early work on proxy records, the science of paleoclimatology has moved on. Since 1999, there have been many independent reconstructions of past temperatures, using a variety of proxy data and a number of different methodologies. All find the same result — that the last few decades are the hottest in the last 500 to 2,000 years (depending on how far back the reconstruction goes).